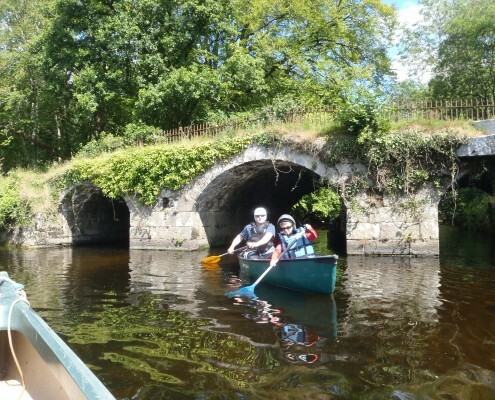 This self-guided canoe tour begins at Goresbridge and you will travel through lower Ballyellen, Ballytiglea, Borris House Estate, Clashganny and Graiguenamanagh. 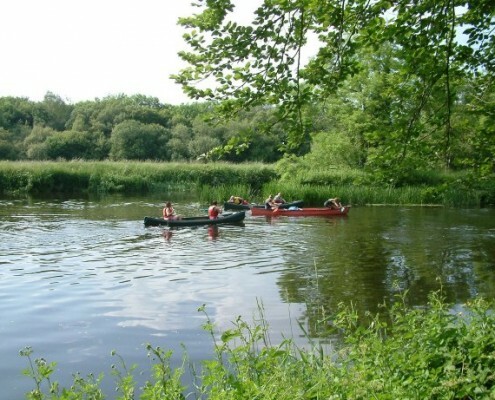 Get Family and Friends together and take the 3 day self-guided canoe trail. 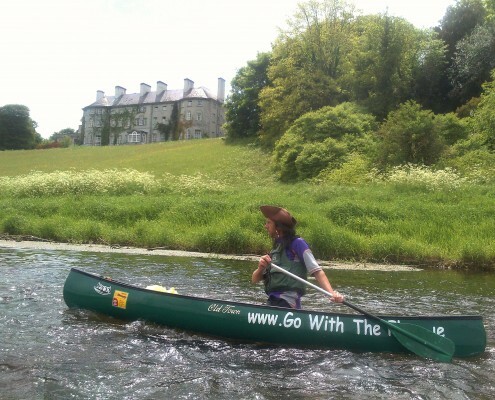 Starting in Bagenalstown and paddling through Goresbridge, Borris, Clashganny, Graiguenamanagh, finishing up in St. Mullins. Somehow – inexplicably to those who have discovered it – the River Barrow remains one of Ireland’s great secrets. 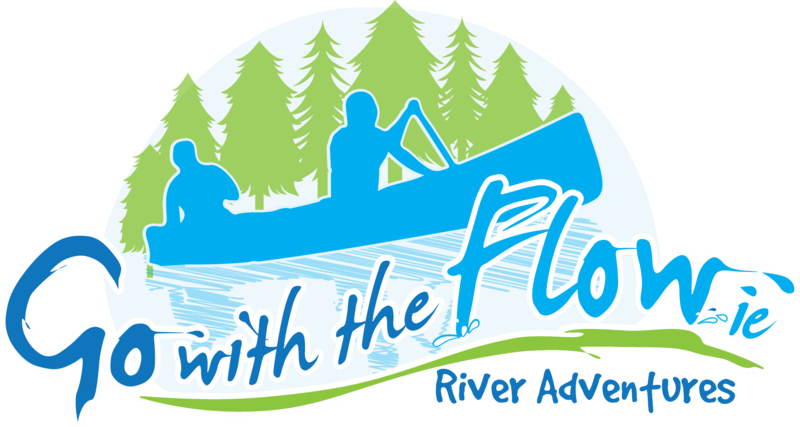 The river boasts a towpath that’s perfect for walkers and cyclists, but really, the only way to properly experience this magnificent river is from water level, and a canoe trip along its length is one of the country’s premier adventures. 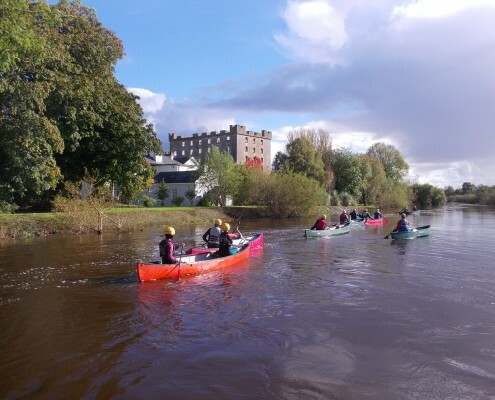 Wending its way through six counties, across rippling rapids, through fantastic forests and historic towns, the Barrow takes paddlers on an incredible journey, full of adventure, wildlife encounters, unique characters and brilliant stories. Whether you’re looking for a full guided experience, or if you’d prefer to be the architect of your own adventure (after getting access to the best gear and local knowledge), Go With the Flow can provide all the expertise, equipment and logistical support you will need for a life-defining trip. For those who discover this hidden gem, the fact that the Barrow still flows under the radar of the masses only increases its appeal. Charlie knows the Barrow like the back of his hand and you couldn’t ask for a better leader, but the river is also ideal for independent self-guided groups who want to wild camp on the river banks and explore at their own pace. There’s a point on the river Barrow in county Kildare about halfway between the country towns of Athy and Carlow, when you realise that you are in the middle of absolutely nowhere and you’re surrounded by silence as you glide slowly through the reeds, flanked on both sides by trees and rolling fields of verdant emerald green. There’s only one thing to do, sit back and soak up the solitude. For nearly two hundred years boats have plied the Grand canal network, first transporting peat to Dublin and beyond and latterly ferrying journeymen through the languid countryside. 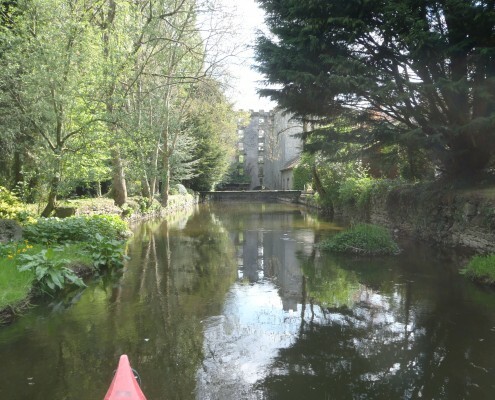 A week spent along the Grand canal and down the river Barrow, one of the most beautiful navigable stretches in Europe, is time spent recharging the soul: after a few morning checks, just undo the rope, Go with the Flow, slowly paddling your way to the next ruined castle or cosy friendly local. 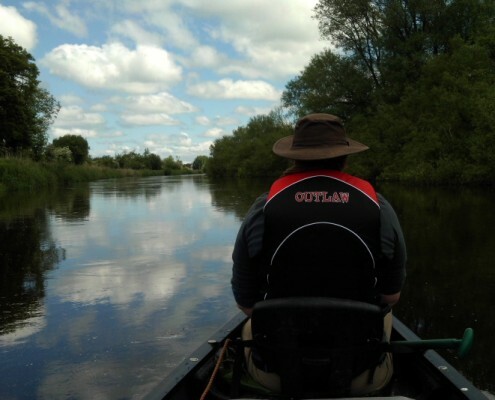 Idle days make for idle ways and the beauty of canoeing is that you have to do very little to keep on the straight and narrow, the rest of the day spent along the backwaters of middle Ireland at a leisurely pace. But if you are going to go nowhere fast, there can surely be fewer places better than the Barrow. Yellow Iris, cuckoo flower and the heavily scented meadowsweet line the riverbank. Herons let you get tantalizingly close before launching off across the water and there’s a traditional pub at every turn each serving finer Guinness than the last. 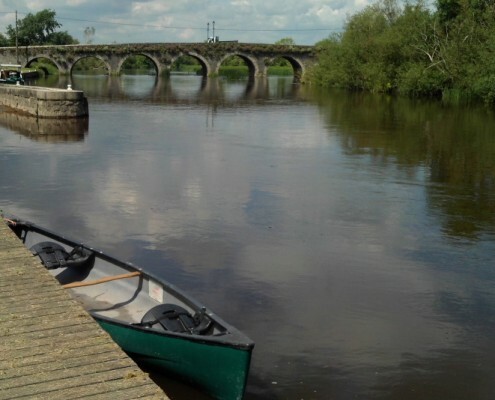 Five days of canoeing along the idyllic Barrow river from Monasterevin, Co. Kildare through Carlow to New Ross, Co. Wexford is one of Ireland’s best-kept secrets. 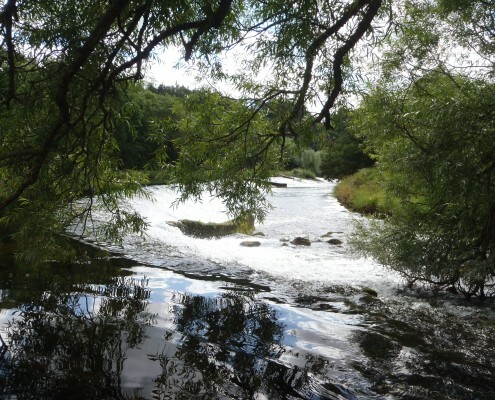 This sweeping river is as wild and untrammelled as the Orinoco or Volga in parts, with only a Kingfisher flashing by or an Otter hunting Salmon. 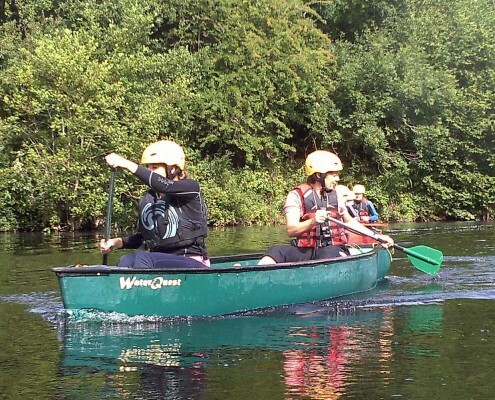 Very reasonable Camping or B&B options include two seat canoe, dry bags, buoyancy jackets etc. Kelly kettle and tent if required. 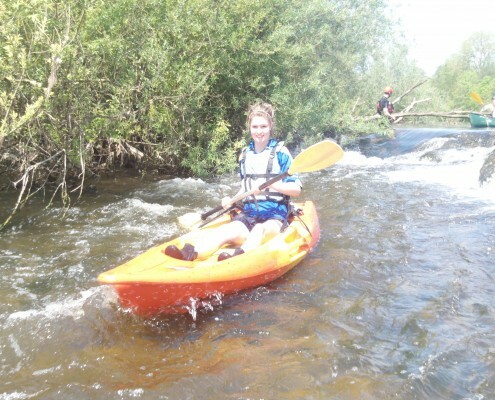 thank you so much for your interest in joining a very satisfied list of adventurous paddlers. All of our trails are available as self guided tours. Please read through this info and give me a call. It will be just the two of you together along the way but you will run into others. Wild camping is standard and tolerated – Leave No Trace applies. There is very very little light pollution along the trail once you camp out of the villages. 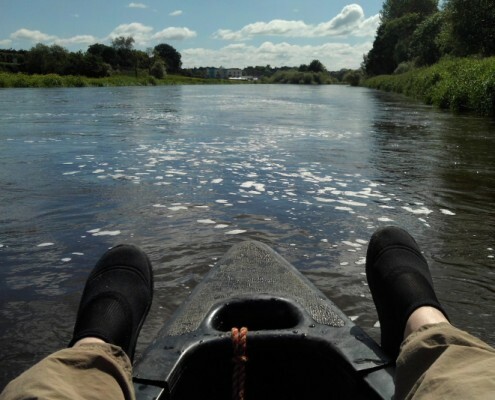 For about ten years we have been organising “Paddle your own Canoe” holidays on the beautiful, peaceful and interesting Barrow river. We will meet you by the river with your two-seat canoe and paddles, some dry bags, buoyancy jackets and a Kelly kettle (Always nice be able to pull in and have a brew with out reliance on the grid) and if required a tent. At this stage you will already have decided on choosing one of the following options -based on two people sharing. All the prices above are based on a Monday to Friday Booking. Alternative days by arrangement. If you are camping then you should know its wild camping. We can supply you with a tent and a kettle. When ever you feel like calling it a day you just pull over, set up tent and settle down for a relaxing evening and night in the great outdoors. Leave no trace policy applies. For those choosing a B&B or Hotel option you will have a set finish point each day. Usually no more than 20k going with the flow. It is also possible to add an additional night along the way and spend two nights in one of the towns or villages enroute. Typically you will be paddling for 2/3 hours in the morning and similar again after lunch. The river is very peaceful and quite intimate. 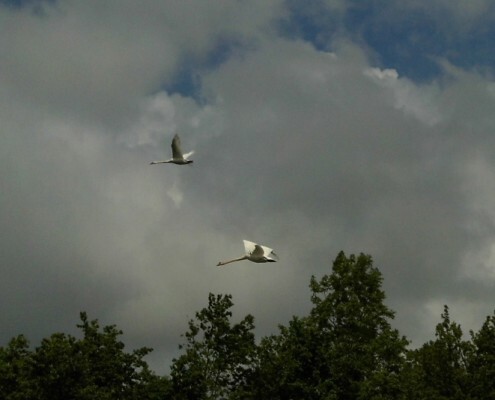 There is an abundance of nature and wildlife all around. Walkway along the route is popular so you can expect many friendly faces, waves and chats and there are also many houses and old cottages, ancient ruined castles, farms, pubs, restaurants and stately homes. Each little town and village has its own unique character with plenty to offer the curious tourist. All accommodation is located immediately adjacent to the river or very close by. At night the canoe is locked up by you at a jetty. Lock provided. An audio guide to accompany you on your expedition is available as part of the Guidigo series. You can down load the app via Google Play here then download Barrow way Historic trail. We do not provide any insurance for self guided canoe holidays. 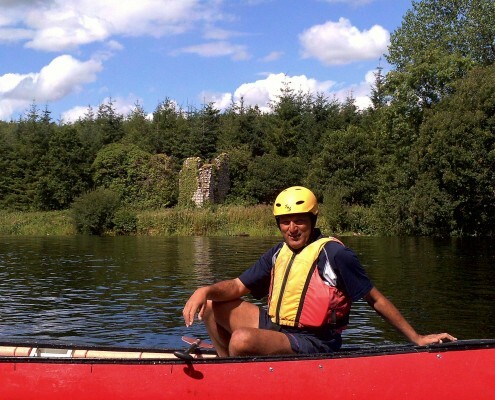 You are therefore strongly advised to take out travel insurance that includes sports cover of canoeing up to Level 3. I have included some additional links, information and reading recommendations below. If there is anything else I can do to help make this a reality for you please let me know. I hope I will see you on the beautiful Barrow river in 2015 / 16 season. Cycle hire is available and the track is 90% completely off road following the route and towpath of the Grand canal from the center of Dublin. The trail is 60km long and best broken into two easy days. On arrival into Dublin you will spend the first night in a quiet hotel located along the leafy banks of the grand canal. The following morning after a nutritious breakfast you will follow the canal out of the city and into a rural landscape on its way to meet the river Barrow. Cycling this route is a mixture of paved (70%) and nonpaved. Your first night enroute will be spent in the sumptuous, elegant and extremely well appointed Lyons Estate. In the evening you can enjoy a charming rural setting and country scenery, a walk and an A La carte restaurant. As a detour, nearby is the humble grave of Aurthur Guinness the world famous brewer. Continuing on day two you will cycle through the waterside villages of Sallins, Robertstown, the canal junction of Lowtown and Rathanangan. You should arrive early afternoon and you can again look forward to a most pleasant evening in period surroundings. Relax, chill out, I will see you down at the river in the morning. 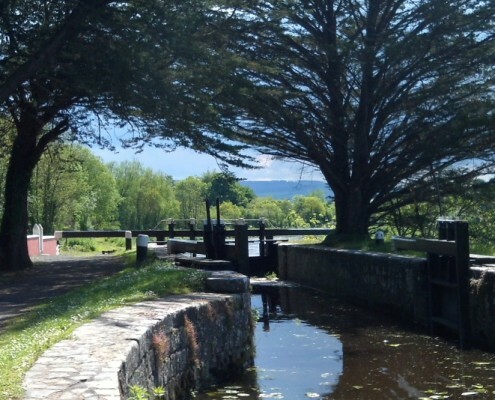 For cyclists, the towpaths of Ireland’s waterways are a perfect amenity, a treasure trove of tranquil settings, constantly changing scenery and glimpses of our past. They afford a safe, fume-free environment without the access problems of our hills and mountains. 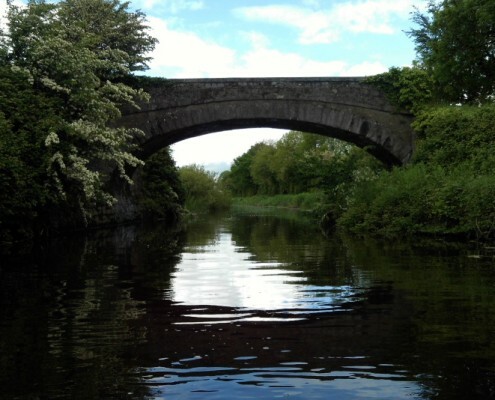 Availing of the paths once used by horses to pull barges along canals and canalised rivers, the author documents and maps 29 recommended off-road tours along some of Ireland’s most scenic and historic waterways. This is a link to maps of the entire route. Highly recommended read in advance of travelling the river trail. One of the most entertaining Irish waterways books, making a welcome reappearance in print. A charming description of the Barrow, the second-longest river in Ireland, by a former Irish ambassador. Begins at the source in the Slieve Bloom mountains and ends at Hook Lighthouse, with walking, talking, boating, legend, history and poetry. The navigation guide in the back doesn’t seem to have been updated, but nonetheless this is an essential item on the waterways bookshelf. · Guide to the Grand Canal, 6th edition, Waterways Service and the IWAI, 1999. Barrow Bridges by John Duffy is also very interesting and well illustrated. The Barrow river is definitely one of the most underrated gems in western Europe. I have paddled this fascinating and interesting river from close to source to sea on many occasions over the last 20 years. It’s like going to your favourite uncle’s farm, time and time again. It plays with you, yet holds you safe. It provides you with surprise after surprise. Always something different each time you return. It is the host of a hundred and one amazing stories. It is always fun and often very exciting. Paddling through its land is rewarding all the way. Each little town or village so proud of its heritage so eager to welcome you. Castles and ring forts, ancient dolmens, big old mills from a bygone era. Pubs, little grocery stores, the occasional passing walker on the tow path once used by the draft horses to pull the small barges full of curiosities up and down the country. The river itself is a living memory of the navigation and trade route it once was and you are reminded of this each time you pass or shoot one of the 26 Weirs. The old Locks and lock keepers houses engage you as you reflect on what life was like for the family that lived the river way of life. And when you consider that the last Guinness Barge only stopped delivering its precious cargo just 50 years ago along this waterway, its hard to believe that you can now paddle 70km of intimate navigation and chances are you may not encounter one moving motorised craft of any description. Day 1 will start in Athy, Co. Kildare. Before you get on the water I suggest a visit to the local Athy Heritage Centre-Museum. This centre has the only permanent exhibition anywhere devoted to Shackleton. Highlights include an original sledge and harness from his Antarctic expeditions, a 15-foot model of Shackleton’s ship Endurance, an exhibition of unique Shackleton family photographs and an audio visual display featuring Frank Hurley’s original film footage of the Endurance expedition. This scale model replica of Sir Ernest Shackleton’s ‘Endurance’ was used extensively in the making of the highly acclaimed Television drama ‘Shackleton’ starring Kenneth Branagh. 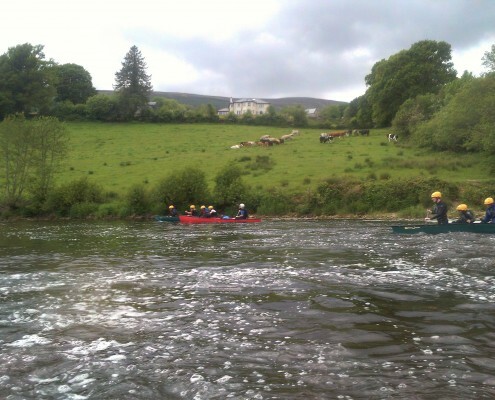 Now on the water having entered the river just below White’s Castle head downriver, destination – Carlow. Rest a while at Maganey bridge and have some lunch and God willing wash all that down with a pint at the local Three counties pub. Then off again to view those same 3 counties enroute to Carlow. 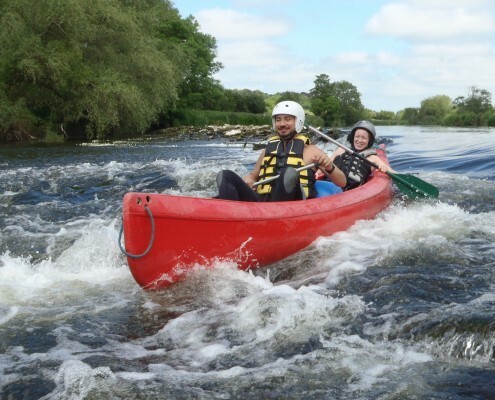 Starting in Co. Kildare we will be in county Carlow after a couple of leisurly miles and a bit of whitewater and then of course Co. Laois forms our western bank. Also along the way you will be able to view Grange Castle and a little further down Shrule Castle a former home of William Hartpole the ninteenth century historian. As you make your approach to Carlow, paddle quietly past Bestfield Lock so as not to disturb the spirits that haunt the channel. In the days of commercial traffic, boatmen who rested nearby told of strange knocking on the hulls of their barges at night. 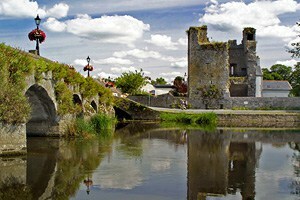 Now in Carlow tie up at the boat house and head off to explore all that this buzzing market town has to offer. A suggestion of accommodation in Carlow would be The Dolmen Hotel. Its a little paddle out of the town ( 15mins) but the canoes can be pulled up on the bank at the property and left overnight – no worries. Town then is only a 5 min taxi away. The visual centre for contemporary art and George Bernard Shaw Theatre. Visit Carlow brewing company and sample on of the best beers in Ireland then check out some of the famous Carlow pubs like Dinn RI, Tullys, Scrags and McLoughlins. Carlow has plenty of excellent restaurants, pubs and varied night life so be prepared for a late one. Start and finish times each day are flexible – your choice. However it is envisages that you will do approx 5 hours of paddling daily. Leaving Carlow, your destination is Bagnalstown. A few miles south you come first to Milford – a beautiful and picturesque river crossing. Carlow was the first town in Ireland to receive electric street lighting (circa 1890) as a result of genny wheel installed in the mill buildings here. Continuing south we pass close to Old Leighlin and you can arrange a visit to this site later in the day if required. 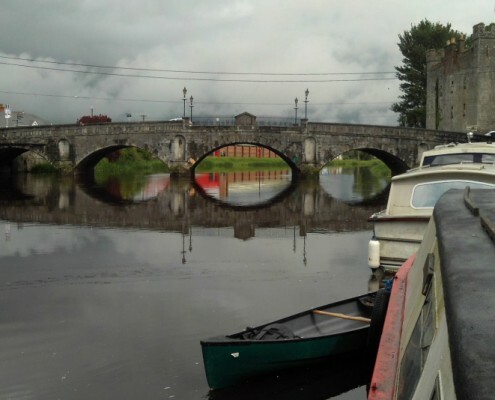 Your next port of call is the town of Leighlinbridge. This beautifully maintained little village was the birthplace of John Tyndall in 1820 who went on to make a huge contribution to the science of physics. In fact it was he who first coined the phrase ‘physicist’. The bridge here is the oldest on the river – built in 1320. A ruined Black castle still stands sentinel at the bridge. However it is a shadow of its former self as Cromwell almost razed it to the ground after centuries of guarding this strategic river crossing. Just off the river is the Lord Baganel Hotel a must for a bowl of seafood chowder and a freshly made sandwich on mouthwatering homemade bread. -Not to be missed. Probably washed down by a pint of the Black – in honour of the castle of course. 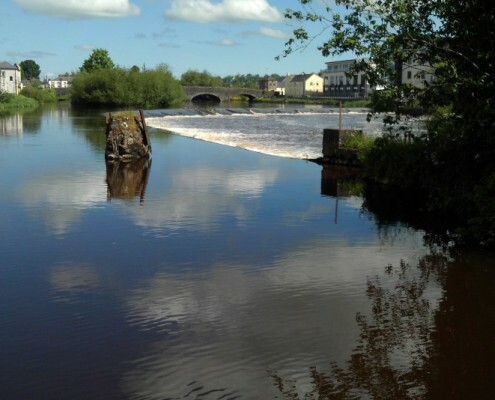 You will have a couple of weirs to shoot but Bagenalstown is only a few more miles downriver. The English name Bagenalstown came from Lord Bagenal, who based the town on Versailles in France, and the town’s courthouse resembles that of Versailles. Bagenal built the town on the River Barrow to allow for trade and access to the town. He originally wanted the town to be called “New Versailles”. Suggestion for accommodation – Orchard Grove B&B or The Lord Bagenal Hotel. You should have the hang of it by now – well hopefully, because from here on you will encounter more and more of the white stuff -water. 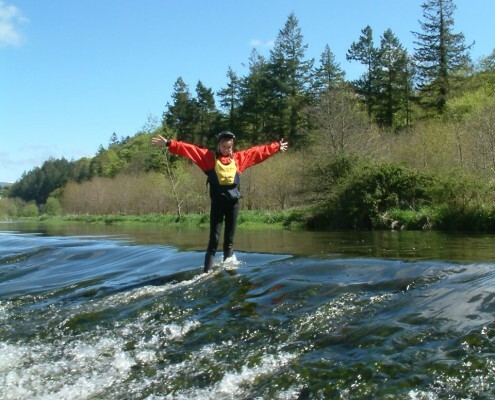 Today will finish at Clasganny a renowned centre of whitewater training and fun. Along the way you will be passing through beautiful, wild rural countryside. encountering many weirs which you can shoot (your choice). Also you will travel along some of the old navigation used by the Guinness barges of the past and see many of the old lock houses. Typical wildlife – Herons, Kingfishers, dippers, duck, swans cormorants and egrets and I could go on …… did I mention the otters. 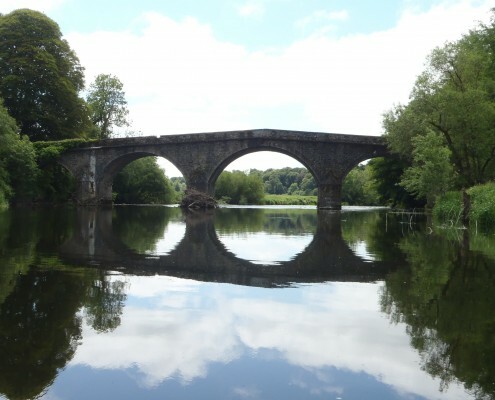 Starting below the beautiful 9 arch bridge in Goresbridge in Co. Kilkenny your tour kicks of with a great bit of excitement as you shoot the weir below the village. The river then gently turns through a sweeping right hand bend as the 200 year old Barrow navigation lock house comes into view. Lower Ballyellen lock house is located just across the river from Barrowmount House – the home of the Gore family from 1710 to 1863. Sir Ralph Gore built the bridge in 1756 and the town was named after the family. 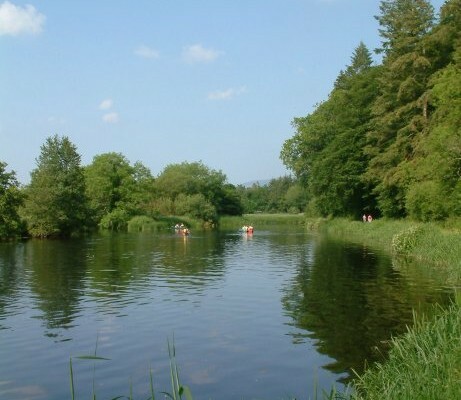 Paddling on through serene and majestic pine woods on the right and the old horse towpath on our left we soon arrive at Ballytiglea Weir. The weir itself is low enough but provides a stunning backdrop to a contemporary wooden hunting lodge which looks on from across the flood plain. We will shortly be entering the Borris Demesne but first we have to shoot the weir and negotiate the rapids below. The safer drops are first leaving the high drop for those of you with a little more appetite for adrenaline further along. You will be going down the rapids before you know it – watch out for the plum trees all along the left bank. No really you should try and avoid them or you might take a dip. Anyone wishing to avoid this whole ordeal can of course take the navigation channel and meet up with the river further down where the river is placid and winds it way through the quiet oak woods of the Borris house estate. Borris Demesne is the seat of the MacMorrough Kavanagh family, descendants of the high kings of Leinster. One of the best known members of this family was Art OG MacMorrough Kavanagh a fine solider who waged incessant warfare against Richard II and his English forces in Ireland. He had many close escapes from capture, and finally died in New Ross in 1417 from poison administered, it is said, by a jealous woman. He was buried at St. Mullins and his funeral procession was said to have stretched the 6 miles from New Ross to the Graveyard. Another well known member of the family was Morgan, who served somewhat unwillingly in the army of Fredrick the Great – King of Prussia. He was said to have been the largest man in Europe and Fredrick allowed him to visit his homeland on condition that he would return with his four brothers whom he said were bigger and finer men than he. Safely back home Morgan Prussia, as he became known, used to climb nearby Brandon hill on the anniversary of his return each year and make a royal salute to Fredrick. A remarkable nineteenth century member of the family was Arthur or the Incredible Mr Kavanagh. It is rare in itself to find a story of coming out of Ireland about a good landlord. But such a story becomes legendary when the landlord-hero happens to be a man born without arms or legs! Starting life with those two staggering handicaps, in the mid-19century, when medical science was still primitive, Arthur Kavanagh lived a more than normal life. Armless he wrote letters and diaries, he drew and painted. Legless, he rode horseback across Europe and Asia and became a skilled huntsman. His adventures in the far reaches of Russia, Kurdistan, Persia and India would have challenged the resources of an able-bodied man. He was a skilled yachtsman and at the age of thirty-five, having become a member of the British parliament he frequently moored his small sailing craft outside the House of Commons having navigated the Barrow, Irish Sea, English Channel and Thames Esturary. Moving on we will shortly be stopping at Bun na h’aibhinn where the mountain river enters the Barrow. Pulling the canoes up on the bank its a short walk within the Borris estate to the final resting place of The incredible Mr Kavanagh who died on Christmas day 1889. From here its a short walk to up to Borris House where you will be greeted and brought on a tour of the house by a member of the Kavanagh family. (This must be pre arranged) This beautiful and well maintained house has had many famous names as long stay guests such as Mick Jagger and the Stones, Nick Cave, The Cranberries and various other members of the music fraternity. It has also been the venue of quite a few society weddings. The tour is very interesting as the house has many fascinating stories to tell of its sometimes troubled history. 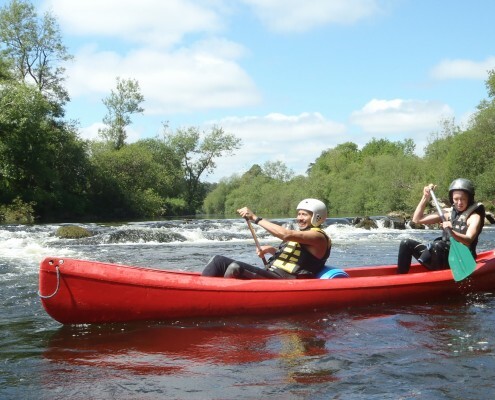 The paddle through the ancient estate is quickly followed by some some excellent, playful white water with the weir at Clashganny and the double drops at Ballykeenan weirs and rapids. Have a pint in O Sheas then Joyces the Daltons the back to Joyces and back to O Sheas again and then finally the last on or as we say in Ireland “DEOCH an DORAS”. Starting where you finished at Clashaganny. Nothing like a quick dip to clear your horizons, right ? 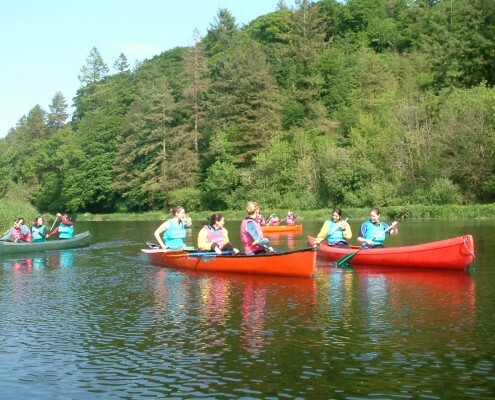 Follow along after all this excitement with a paddle through the pine forest – as you make a quiet entrance into historic Graignamanagh. A very old eel weirs is your last obstacle. Situated in the middle of the river it channels the water between two walls where the eel cage was lowered into the flow nightly. This type of structure was used extensively throughout the major rivers in Ireland to harvest both fish and eels and was a valuable and profitable asset to any family who operated one. Stop off here and have a look around and a bit of lunch. There is a beautiful old abbey and some very quaint shops and pubs. Leaving Graig we now to St Mullins. There is some incredible scenery along the way as the mountains on either side close in and the river gorge narrows. You will also have to shoot some excellent drops, weirs and rapids. It will take a further 2 hours to reach the tidal section where you can pull in for the night. Things to do and see: Remains of 6th century St Mullins abbey. You can stay just outside the village in a local B&B with amazing views. The next bit of river is a tidal section to New Ross taking approx 4 hours with beautiful enclosed wooded hillside banks. 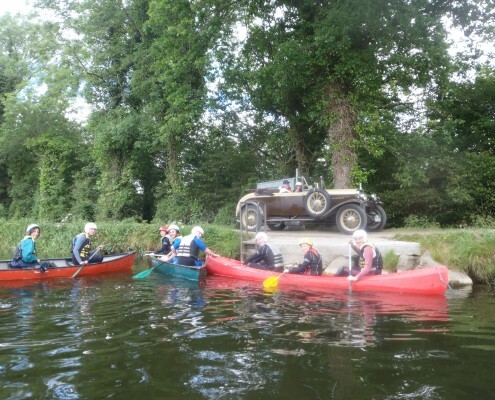 You have to catch an outgoing tide so if required I could transfer the group to the River Nore for an excellent trip from Thomastown to beautiful Inistigoe passing through the beautiful Mount Juliet estate along the way. This is just a sample of the varied and interesting atmosphere this river creates for the adventurous traveller. If you require further information or clarification on anything please write to me I am only too happy to help. For those who want to camp wild we can provide you with a tent. 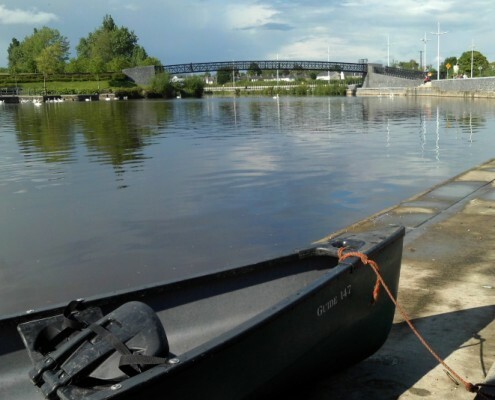 We had been thinking for a while about exploring the Barrow river, and finally decided to go ahead and book a self-guided B&B canoe-trip with Charlie. 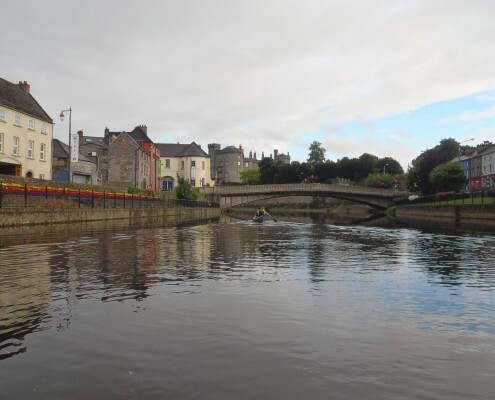 As we wanted to see as much of the river as possible we started in Monasterevin and gave ourselves six days to make it down to New Ross. 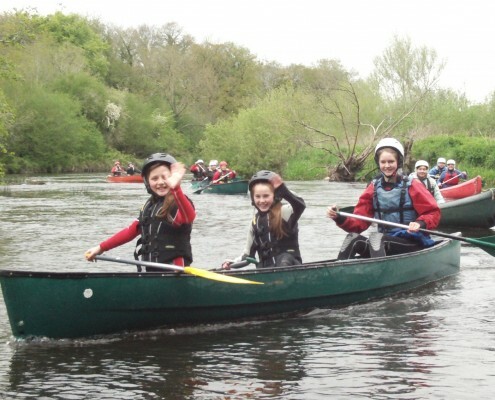 We had not used a canoe before, so it was good that the first stage down to Athy was a very easy stretch, with no weirs or locks, to get the hang of the paddling and steering. As a bonus on that day an otter briefly popped his head out of the water to see what was stirring the waters in his usually very quiet river patch. There was more wildlife to see in the next few days as we floated down the river, mostly swans and herons, but we also saw glimpses of a kingfisher, and close to New Ross a seal hung around for a while to investigate us. However, the highlight was a barn owl that flew past us along the river bank. All in all it was a great holiday, gently floating along the river and enjoying the tranquil surroundings, stopping off in nice spots along the way for lunch or a brew, and staying in some fantastic B&Bs along the way, who were very welcoming and helpful. Charlie also has a long list of interesting sightseeing suggestions along the Barrow. Brilliant trip, and we’d love to do it again sometime.